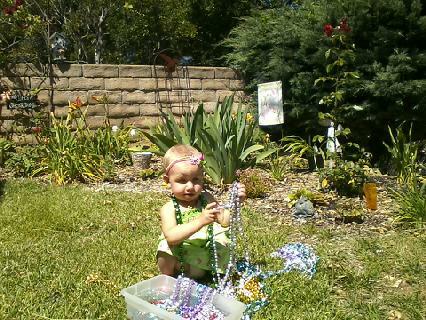 I found the mardi gras beads! I am So excited! I put some on my neck and some on my wrist, and I scatter them in the garden to decorate everything. I put them back in the box, then dump it out, then move the box to the sidewalk and fill it back up. I feel with my fingers how some are big and some are small. They make a funny sound rattling in the box, so I fill it and dump it over and over. Then I go back and collect up the ones I dropped other places. I put three on my neck, and those three are tangled with more, so I watch as that wad of necklaces trails along behind me. I’ve also found my bubbles. I bring them to Mama saying “Bubble? BUBBLE?” She tells me one minute. I put my bubbles in the necklace box and come back over, saying please with my hands and “bubble” with my mouth. Okay, she says. We blow some bubbles but this bubble juice is not very good. We only make three small bubbles each time. I pick up the lid from the grass and put it back on the bottle. More shiney necklaces!